Beautiful small tree with white flowers that bloom in late spring. Easily grown in a range of soils but prefers moist organic soils in part shade or full shade. 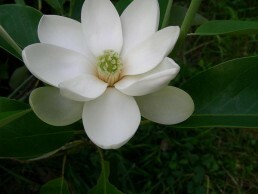 Of all magnolias is the most tolerant of wet conditions. Beautiful white flowers bloom in late spring.